Denver Police Department on Thursday executed search warrants and made arrests at “multiple” licensed marijuana facilities in the metro area, police and city officials said. Police officials, citing an ongoing investigation, would provide only limited information as to the scope of the enforcement actions, number of arrests made and the businesses involved. “It’s ongoing, and we still have work to do at this point,” Doug Schepman, Denver Police spokesman told The Cannabist. Initial information available Thursday indicates that enforcement actions were occurring at Sweet Leaf dispensaries across the city. 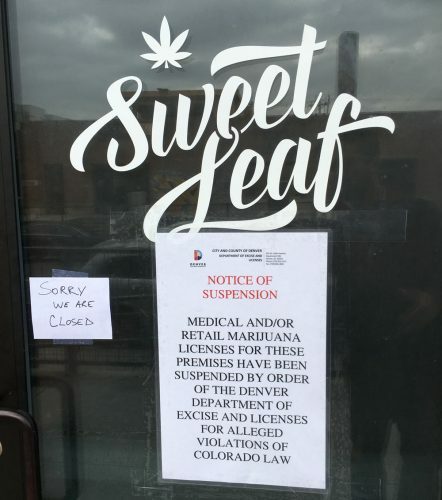 Sweet Leaf’s marijuana business operations across the city and county of Denver were shuttered Thursday as a result of an investigation and enforcement action by Denver Police. The suspension covers 26 licenses — including medical, retail and cultivation — for operations that do business as Sweet Leaf, said Dan Rowland, spokesman for the Department of Excise and Licenses. According to a Department of Excise and Licenses order of summary suspension, licensing officials suspended the licenses after reviewing an investigation completed by the Denver Police Department. The 26 licenses affected were issued to nine limited liability companies all doing business as Sweet Leaf. No other suspensions were issued against other marijuana businesses as of midday Thursday, Rowland said. Schepman said multiple agencies and officers are involved in the action. The U.S. Drug Enforcement Administration was not involved in Thursday’s enforcement actions, Special Agent Randy Ladd, of DEA’s Denver division, said. The Cannabist has put out queries to local, state and federal law enforcement agencies. Officials for Sweet Leaf could not be immediately reached for comment. 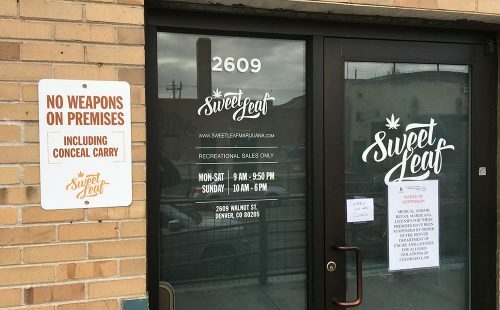 At the Sweet Leaf dispensary located at 2609 Walnut St., a police officer answered the door and declined comment to a reporter from The Cannabist. It was not immediately clear to what extent Sweet Leaf’s facilities were affected beyond Denver, where the company runs 10 stores — spanning medical and recreational marijuana sales. Aurora police spokesman Bill Hummel said Aurora police had been assisting Denver, but referred all questions back to the Denver Police Department. Hummel did not know if the Sweet Leaf store on the 15000 block of East Sixth Avenue in Aurora had been closed. No one answered the phone at the Aurora location even though its business hours are advertised to be between 9 a.m. and 9:50 p.m.
Aurora has not suspended Sweet Leaf’s business license for its East Sixth Avenue location, said Julie Patterson, a city spokeswoman. “We are waiting to receive more information from police investigators to determine whether we need to take any action,” she said. Sweet Leaf has a retail store in Portland, Ore., which was open for business, a person who answered the store’s phone told The Cannabist. The employee said store officials declined comment. Denver Post Staff Writer Noelle Phillips and The Cannabist Editor Alex Pasquariello contributed to this report.